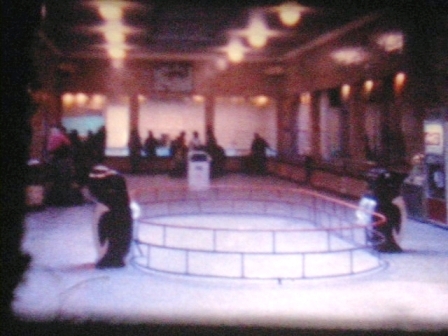 This fist picture is currently the only photo I've been able to locate of Mold-A-Rama at Como Zoo in the past. It is from our family home movies in the early seventies. The Mold-A-Rama can be seen at the right next to the coke machine. My mom says we have more somewhere because I was so interested in it, but as of yet I can't find them. I also remember there being one or more located in one or both entry vestibules. This is a more recent photo of the old zoo building. It is my understanding that this building is currently used for administrative operations of the zoo and conservatory. As you may have already read the William A. Jones Company purchased the machines found at Como Zoo in the early 80's. Luckily some of display items were saved!!! So a VERY special thanks go out to Bill, Paul, and Jones Family for sharing some of the next few items. Display sign from Casey Mold-A-Rama machine. Display sign from Sapphire Elephant Mold-A-Rama. I don't remember Sapphire though; I've often wondered if this came down from the Duluth Zoo were I do believe they had an elephant. An original Sapphire the Elephant from Como Zoo. This is a Doc the Lion from one of the original machines at Como. Apparently the lore with this particular Doc is that it may have been in the display window of the Como machine at one time too. BIG thanks again go out for this one! This is one four newly restore machines you can find at Como Zoo. They are simply AWESOME! New Sea Lion from Como Zoo. New Gorilla from Como Zoo. New Polar Bear from Como Zoo. The new lion from Como Zoo. One item of note about some of these animals... I've been told that originally there were two "series" of animals produced by the design studio, one was known as jungle and the other was ... Hence the difference between the Doc style and the "new" version found at Como currently.